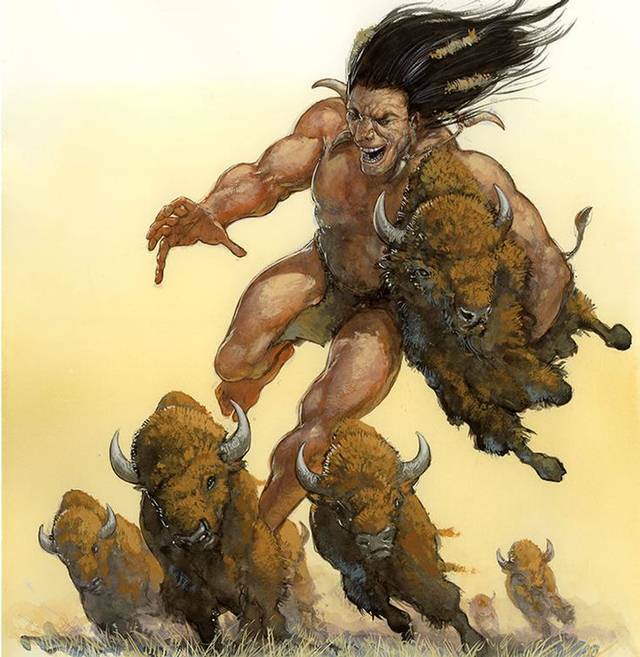 Many legends of various Native American tribes, from the Comanches in the north to the manteños in the south, speak of a mysterious race of giant white skin were wiped from the face of the earth. Choctaw In his book “History of the Choctaw Indians, Chickasaw and Natchez” (1899), Horatio Bardwell Cushman writes: “The tradition of the Choctaw that has long been a race of giants inhabited what is now the State of Tennessee, beings with which their ancestors fought when migrated from the west … its tradition states that nahullo had an impressive stature. ” Cushman says that, over time, the term “Nahullo” became common to refer to all white people, but originally was specifically used to designate a race of white giants with which the Choctaws entered deadly contact after cross the Mississippi river. Comanche In 1857, the chief Ray Vibrante Comanche, a Native American tribe of the Great Plains, said the following about an ancient race of white giants “many moons a race of white men, 3 meters high ago, and much more prosperous and powerful than any pale face who now lives here lived a great part of the nation, extending from the place where the sun rises to where it sets. Its fortifications crowned the tops of mountains, protecting their cities in the intermediate valleys. They exceeded any other nation that has bloomed sooner or later. This story was documented by Dr. Donald ‘Panther’ Yates, a researcher and author of books on Native American history. Navajo Yates also mentions beings known as “starnake” by the Navajo, “A majestic white race endowed mining technology giants that dominated western North America, enslaving inferior tribes. They died or returned to heaven. ” Azteca In Aztec mythology, with the Legend of the Suns, is aware that humanity Quinametzin were created during the Sun of Rain. Its ruler, according to some versions of the myth, was the god Tlaloc, who corresponded him the sun shone during the third cosmogonic epoch, which ended when Quetzalcóatl made Quinametzin rained fire and burned to death. 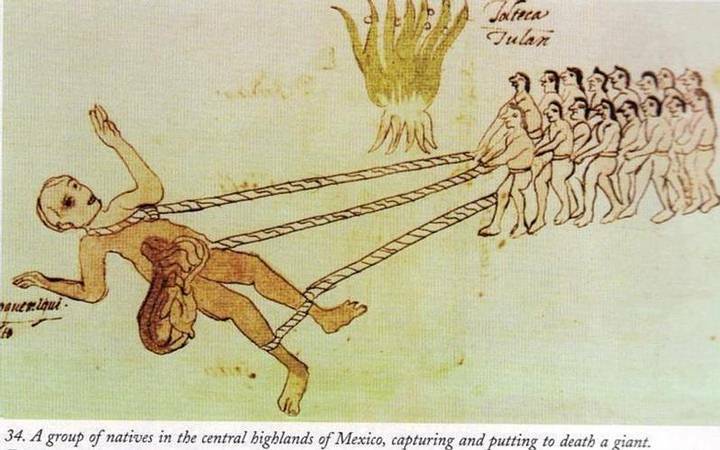 Men dragging a dead giant, Vatican Codex. Men dragging a dead giant, Vatican Codex. At Quinametzin were believed to be the builders of the city of Teotihuacan and Tlachihualtepetl on the main temple rose to the Feathered Serpent in Cholula. The tlaxcaltecas recounted that, near the Spanish Conquest times, they themselves had fought the last Quinametzin. Manta In 1864, Pedro Cieza de Leon, a conqueror, but above all, chronicler and historian of the Andean world, wrote in his “Chronicle of Peru ‘how manteña native culture (in what today would be the modern Ecuador) he described a legendary race of giants, “There are reports concerning giants in Peru, who have arrived at the coast at the point of Santa Elena. The natives were dismayed to see a boat made of reeds reaching its shores with a cargo of creatures, so high that knee to the floor were as big as a man of great stature. His limbs were deformed in proportion to the size of their bodies, and their heads was something monstrous to do with hair hanging to his shoulders. His eyes were as large as small plates “. 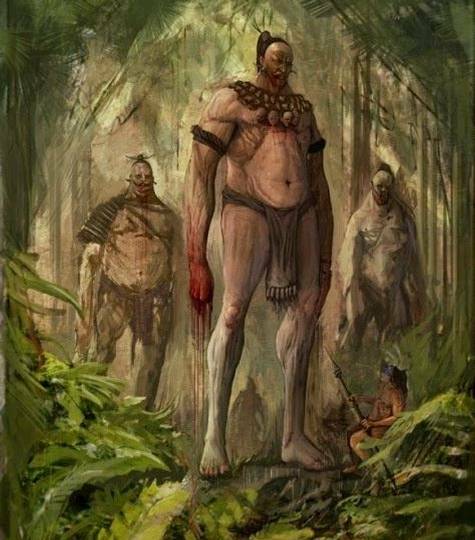 In his chronicle, Leon said that the degenerate sexual habits giants proved repugnant to the natives, so “heaven” he will eventually exterminated. Paiute The Paiute, a native American tribe in the area of Nevada, has an oral tradition that reported the former white settlers on a race of red-headed giant that their ancestors were known as the “Si-Te-Cah” and who lived in a ancient cave. This history was recorded by Sarah Winnemucca Hopkins, daughter of an Indian chief Paiute, in his book “Life among the Paiutes: Torts and Claims” (1882), which describes the “giants” assumptions as bloodthirsty creatures, hostile and cannibalistic. In this story, the Paiute tell a great battle, which occurred at the site now known as the Lovelock Cave, which led to the extermination of creatures. Lovelock skulls taken from the cave. Photo taken about 40 years ago by researcher Don Monroe. 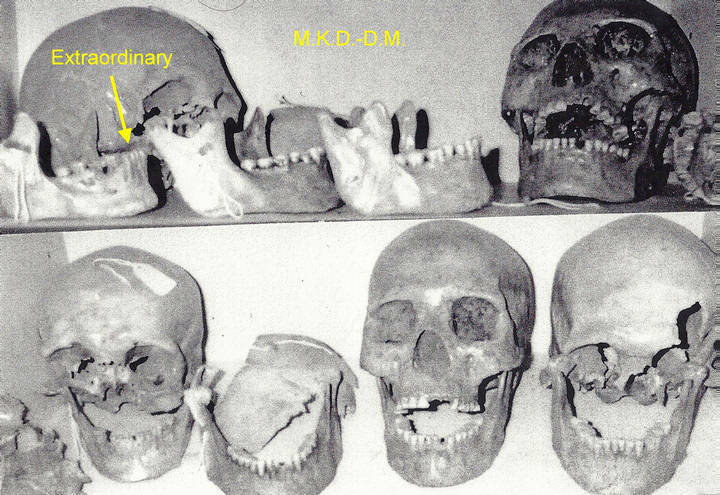 In the early twentieth century, archaeologists found thousands of objects inside the cave giving rise to a prolonged excavation and speculation about the possibility that the Paiute legend was real, because, among other surprising objects which would end largely in private- collections were unearthed bones with marks of cannibalism, sandals almost 40 cm, and skulls with red hair.